The Bluefield Rail Yards stand as a symbol of the importance of the <?xml:namespace prefix = st1 ns = "urn:schemas-microsoft-com:office:smarttags" />Norfolk and Western Railroad to the coal industry. 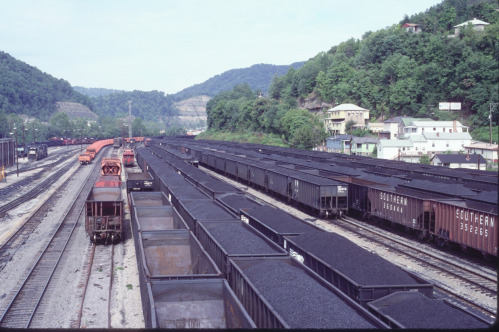 During the prosperous days of the coal boom, Bluefield emerged as the corporate center of the coalfields. The town played a pivotal role in the opening of the Pocahontas Coalfields and was the home of the headquarters of the Pocahontas Division of the Norfolk and Western Railroad. The rail yards are located adjacent to the Bluefield Downtown Commercial Historic District, which serves as the southern gateway to the Coal Heritage Trail. The Bluefield Train Yard remains the busiest yard in the (now) Norfolk Southern Railway system. The location of the division's mechanical shops was determined because of the area's natural gravity "hump," creating the highest point on what had previously been the Norfolk & Western mainline. Railroaders used gravity to help collect eastbound coal cars into unit trains. In the early days, coal cars were "draped" over the hump and sent eastward in trains of 100 or more cars.